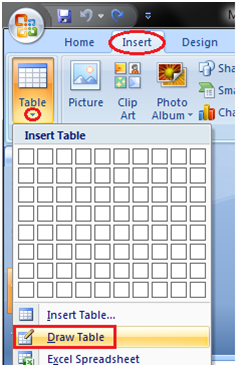 You will see small boxes on top, select the boxes corresponding to number of rows and column that you want in your table. 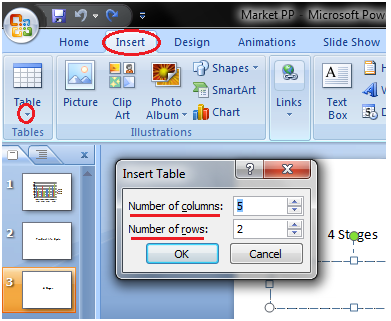 Click the Insert Table option and enter the number of rows and columns then click ok.
Click the Draw Table option and place the cursor on slide. Cursor changes into a pencil. Click and drag the pencil to draw a table border. Click the Excel Spreadsheet option. 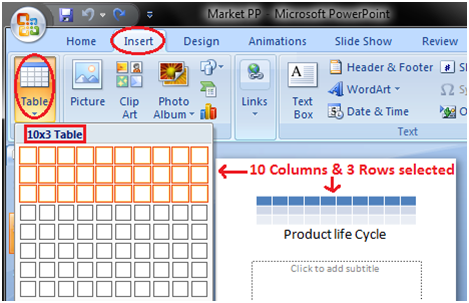 Worksheet will appear in the slide, drag it to get the desired number of rows and columns.